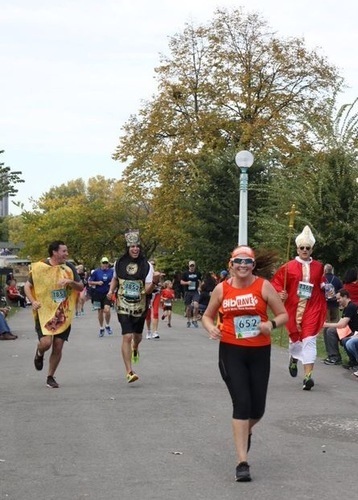 "Art Van Turkey Trot Great Family Fun"
I enjoyed the Art Van Turkey Trot 8K this year and I will tell you a few reasons why. The packet pickup was split up into many days both Sat/Sun over the weekend as well as the day before packet pickup. If you really were in a pinch they did also have same day pick up which is super convenient for those that do not live close to the race itself or if you have family visiting from out of town. It was also great to be able to pick up 5 packets at one time if you needed to. Large group packet pickups were already sorted if you were part of the flock which made grabbing packets easy. The flocks also got extra swag of a cute mug at the end of the race. I was able to get in and out of packet pick up in under 7 minutes which was great considering the line for pickup was outside the door. The swag was great. I really love the Always Be Thankful shirt. The shirt is a great message and gave me something themed to wear to Thanksgiving dinner. We also got some probiotics, a can holder and a zone perfect bar. The day of the race parking was easy and close at the Lincoln Park zoo or local street parking. It was cold but the pre race activities were going strong with vendors, food depository drop off, corn hole, giveaways and samples of food. In the corrals the pace times were clearly marked however some people did not adhere to this or the rules of strollers in the back. The start of the race there was not an issue as the race directors let ample time go between waves. There was Gatorade and water with plenty for the back of the pack. Race Guards were also present during the race in case any injuries appeared. The end of the race had less of a bottle neck compared to last year and moved more smoothly. The post race food was great with 2 mini pumpkin pies, popcorn, bananas, water and Gatorade, beer, bloody Mary shooters, and plenty of free samples along the way. It was also quick and easy to get a photo and due to Athlinks all the photos were free! There were plenty of volunteers on the course which made the race experience so much better! I got a chance to meet many from out of town including a whole family from London. The family friendly feel at the end really leads to many open conversations and possibly new runner friendships. I will absolutely do this race again. I may want a whole flock next year! 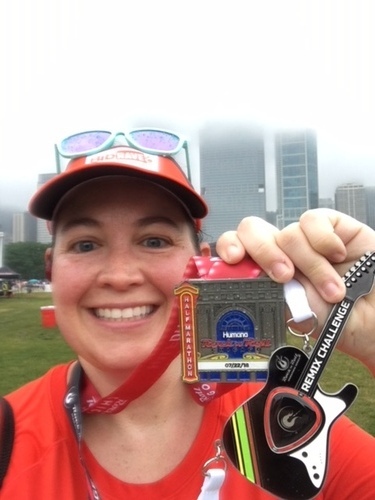 "Chicago Half Marathon Great But Bring Bug Spray"
I have never done this race before. It was at a perfect time of year for a race and was not too hot, finally!! I am going to recap the pre race events, race itself and the post race festivities. The regular emailed communication was great to have and keep us excited about what to expect. The emails also kept us updated on the latest news. The expo was great with easy parking. Everything you needed was set up in multiple stations (bib in one location, back of the expo for your shirt and another location for parking validation). I would have preferred to have one station for the essentials. The multiple stations did ensure you saw all the vendors at the expo. The variety of vendors I really appreciated as well as the free samples. The swag included a nice long sleeved tech shirt, hand lotion, probiotics (this brand is $$), drink holder, zone bar and various coupons with discounts or free offers. Overall the swag was really nice and stuff I will use. I was not sure how quickly parking would fill at MSI and the surrounding streets. I used a ridesharing service and was at the race early. There were significant backups on Lake Shore Drive but they moved relatively quickly. Parking was still available at 6am from what I could tell. The race start was nice and organized. The biggest issue was one I did not expect, mosquitoes! The garbage bag I had to keep me warm was one of the only things that helped to protect me from being eaten alive. The other helpful piece of clothing was my buff which I was able to pull over my neck and face. Even with this protection I had multiple bites. Next year I would also add mosquito repellant to my list of items needed on race day. Thankfully I was in an early corral which helped me get away from all the mosquitoes. The weather was cool and perfect. I can’t think of a race I have done recently with weather this good! The local roads were a bit crowded but thinned nicely by the time we hit Lake Shore Drive. I loved the crowds at the start and finish. There was also an entertainer playing Ray LaMontagne that was fabulous. The course was out and back which definitely pumped me up to see the elites racing to the finish. Crossing the finish line I was given my largest medal to date. This medal is amazing if you like race bling (I do)! If you completed the Spring race and this race you got a challenge medal for completing both races (FYI this choice sells out quickly). The post race area was nice with free pizza and beer. The live entertainment was great and right next to the food. We quickly got our Athlinks results to claim and within a week Athlinks had linked our FREE race pictures and video of crossing the finish line. For anyone thinking of doing this race next year I would highly recommend it (with bug spray on). The race route and staging area may change for next year but I am sure the event will still be as memorable. "Run The Mag Mile Fabulous Run"
So I have Run the Mag Mile race once before right after having my daughter. I love this course and running along the magnificent mile. The race held up to my expectations of it again this year. Packet pickup was easy at the Fleet Feet store location in Old Town.I gave the 3 star rating bc there is not really an expo but there is a full running store to browse products. I do wish there was a validated parking option like before but alas the new space does not have access to this. There is a divvy bike station across the street but it was pouring rain on the day I went. Anyone looking to pick up at this location should allow for extra time if you do drive. The swag was great a jacket that has a hood you can cinch and ZIP pockets! Race day was super windy but with perfect temperatures (relief from the heat) and overcast sky’s. There were two sets of porta potties and the waits took about 5-7minutes to get through the line. I really loved the real water hand washing station. The corrals had plenty of room when people moved all the way into them. The spacing of the race was 1 minute between each corral which gave a nice space between all the racers. During the race there were some spectators but I think the weather kept some away. Running on the Magnificent Mile allowed for plenty of room between runners. I love the on course support with Nuun since that is my typical race training drink of choice. I also like that the Nuun was different flavors. The lakefront path was a bit congested for the front and mid pack mostly as marathon training runners were also on the path with bikers. I was mid to back of the pack since I used this race as a training run so my lakefront time was not very congested. Going under Columbus later in the race was also nice to stay on track with my GPS for longer. The medal is gorgeous and huge! I really do love my medals and ones that have city pictures on them even more. Post race there was hot breakfast brunch (yum!) beer and spirits as well as water, sports bars and bananas. There was also live music to enjoy while you were eating and socializing with other runners. I would absolutely do this race again. I would love to see a half marathon course option again but maybe it was not popular. The 10K was a great distance option to have for those that want more then the 5K. The swag and post race goodies are amazing for a race. "Rock & Roll Good In The Rain"
Registration was super easy. Once you are registered communication comes almost weekly with training plan info and race day information. The expo was easy to get to via public transportation or ride sharing services. They had parking onsite but it was $$. The expo had some new vendors this year which I really enjoyed. It is a mid sized expo but never disappoints in the samples and new products. Race day starts early and is easy to navigate via public transportation. Parking is available but is limited right around the race start areas. Bathroom lines were a little long but moved fast. They were out of hand sanitizer in most of the toilets which was gross but luckily everyone was great about sharing what they had to clean your hands. My corral was easy to get into and was not over crowded. It started raining while we were waiting but had been dry until that point. The course for the half was nice but with the rain the bridges were very slippery. It would have been nice to have sections of carpet to avoid slipping. The course was well supported with volunteers even with the rain. There was plenty of hydration on the course. The new gels on course I was not a fan of but others said they liked them. I loved that Race Guards was out supporting the course as there were many people I saw off to the sides of the course and with significant chafing issues due to the race day conditions. My least favorite part of the course was the tunnel under McCormick Place. It was very dangerous with pot holes and puddles and minimal lighting. The Achilles guides had to mostly walk with their partners due to the conditions. I think more lighting in this area or routing around it is necessary to improve safety. The end swag was chocolate milk, granola bars, PB crackers, bananas, boxed water, and Gatorade endurance. They even gave us a bag to carry everything in. The medals did not disappoint and the post race band was playing even in the rain. Overall this is a very fun race with great course support. Pumpkins in the Park 5k was held on Saturday October 21st at 4 in the afternoon. A side note kids races are held before the 5k where the kids get medals and swag as well. Packet pick up was a breeze at Fleet Feet on Friday from 10-7pm which is what I took advantage of to avoid the lines on Saturday. If you do not live in the city or have Friday night plans there was packet pick up starting at 1:30-3:30 onsite at the Lincoln Park south fieldhouse. Parking the day of was street, the Chicago History Museum or Lincoln Park Zoo (make sure if you are in the zoo lot you are far enough south to avoid extra walking. This course due to the congestion for the first 1-1.5 miles and varied surfaces makes it hard to achieve a PR unless you are at the front of the first corral (there are only 2 corrals) the congestion the course is fairly scenic taking you in and around the park. Post race there was Revolution Brewing beer, sprinkled covered apples, Eli's mini pumpkin pies, bottled water, Nuun, mini Cliff bars. There was also entertainment onstage, a pie eating contest, costume contest, popcorn and pumpkin painting. By the evening of the race the free race photos were already available which is such a quick turnaround. The only cons were the varied surfaces and congestion early on. Otherwise the race was very well organized with plenty for the whole family to do pre and post race.